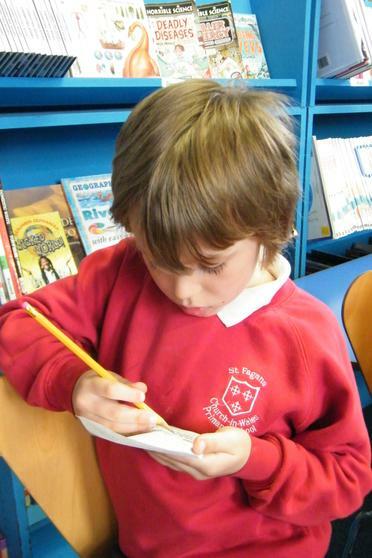 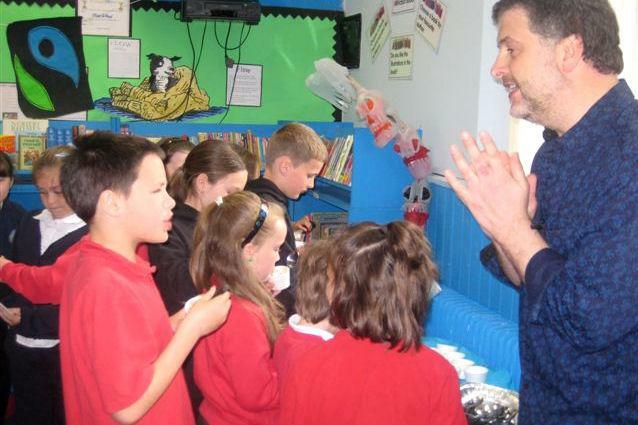 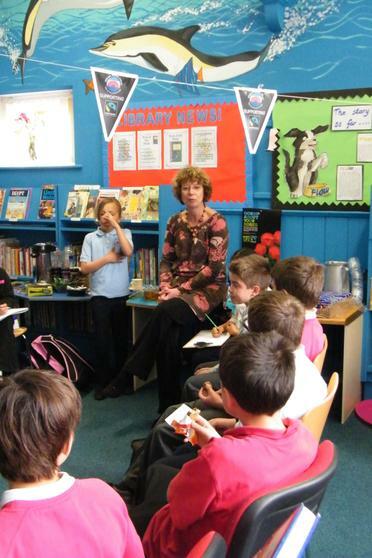 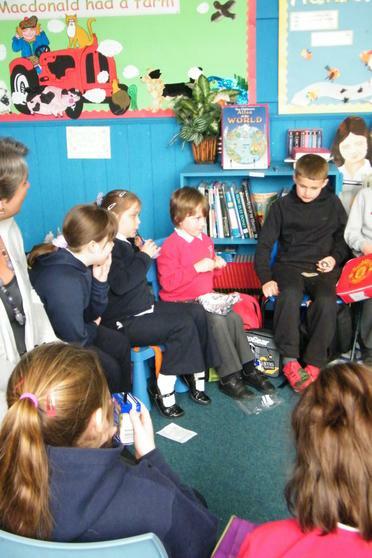 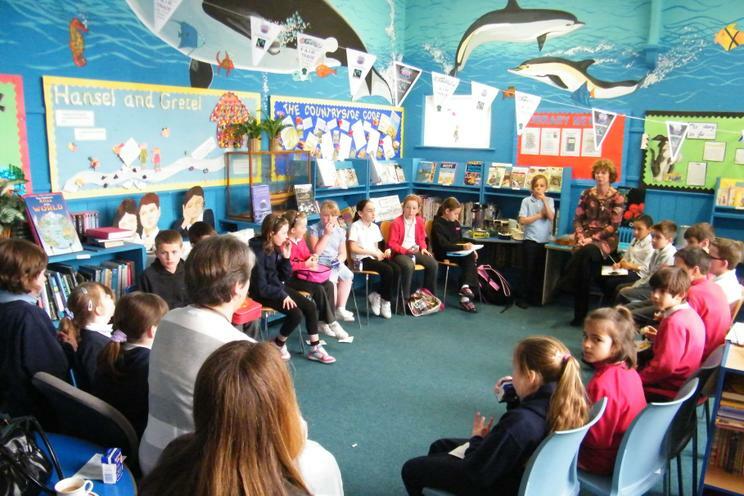 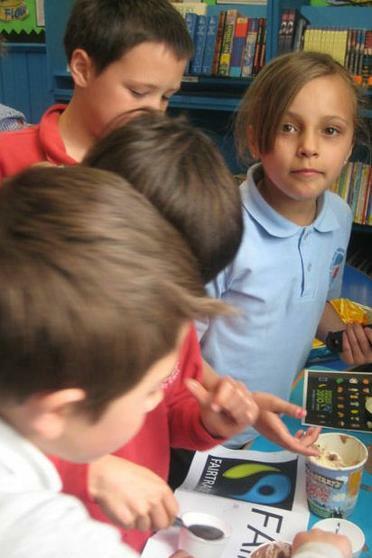 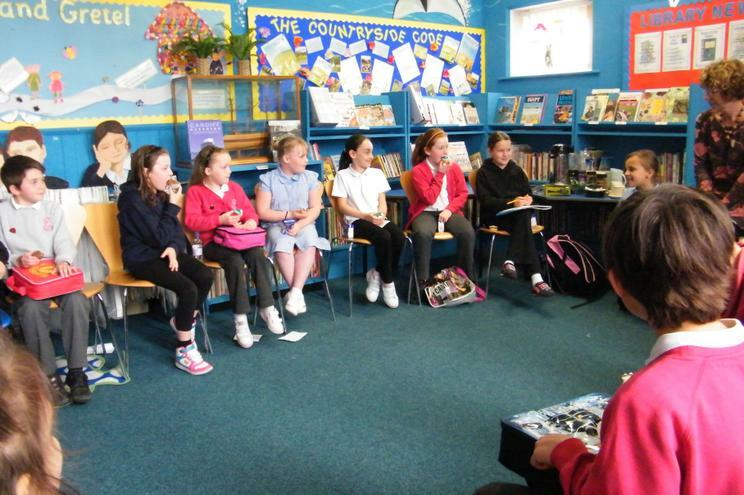 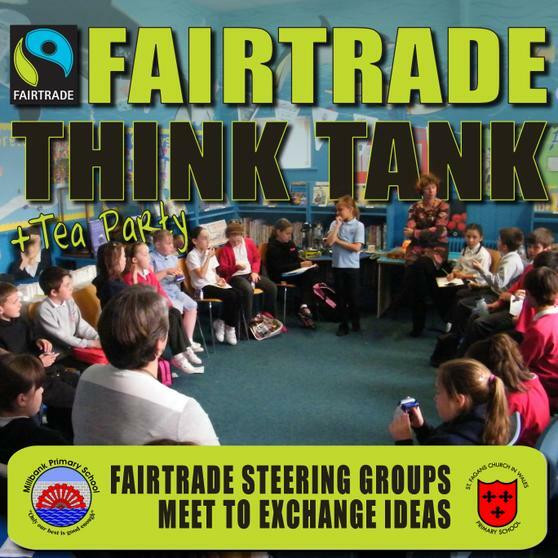 Our friends from St Fagans Primary came along to our FAIRTRADE THINK TANK just before the Easter Holiday on Thursday 14th April. 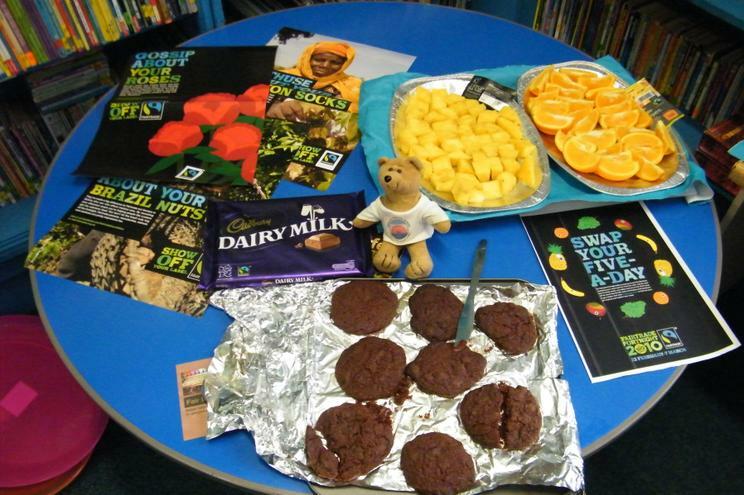 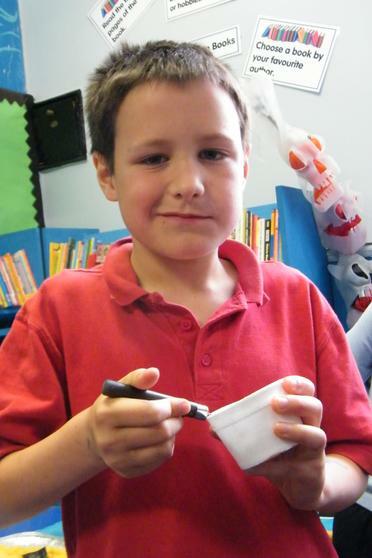 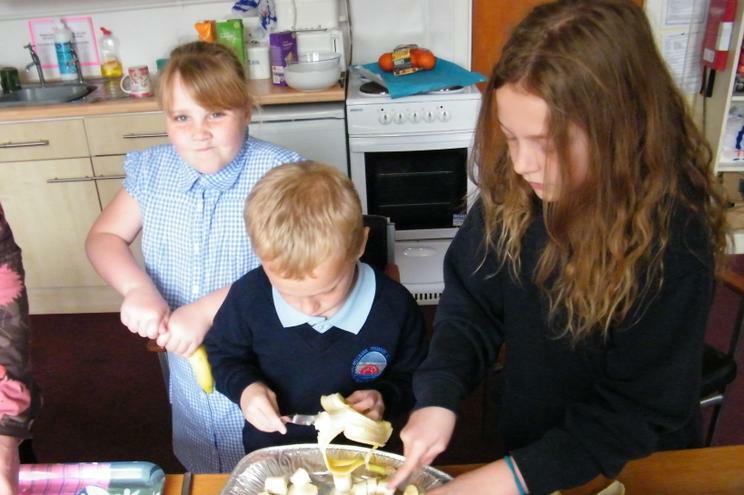 We had a special Fairtrade Tea Party with lots offairtrade fruit, juices and cakes. 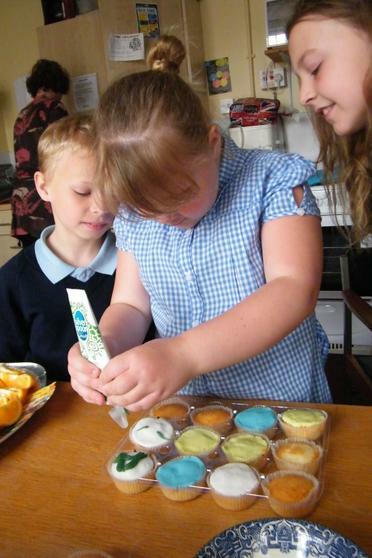 Competition can be very healthy but you can often achieve far more when you work together. 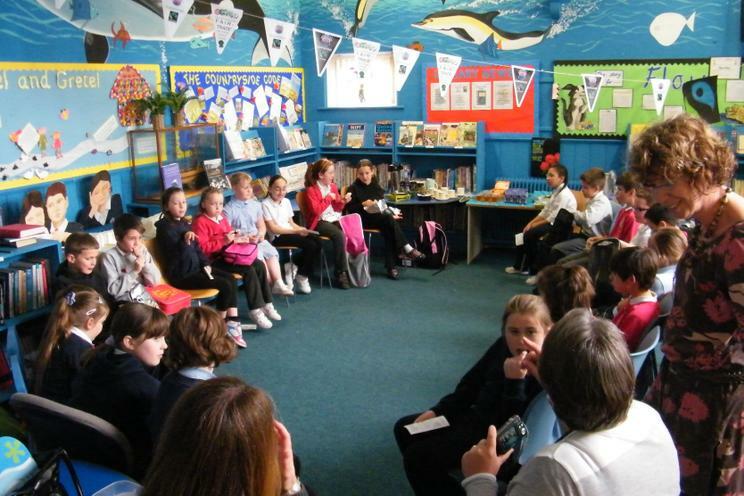 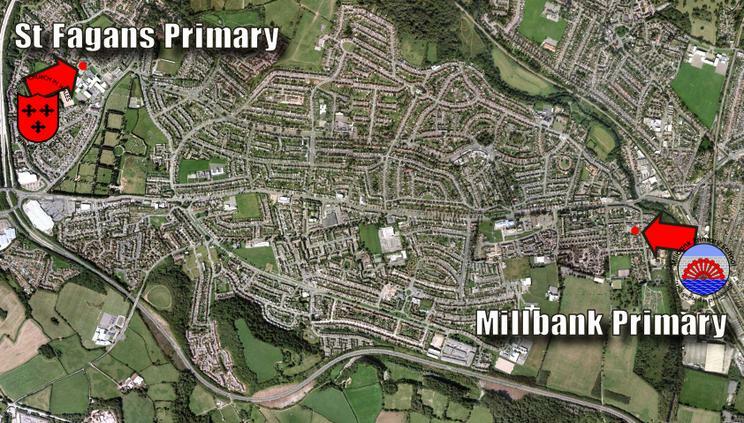 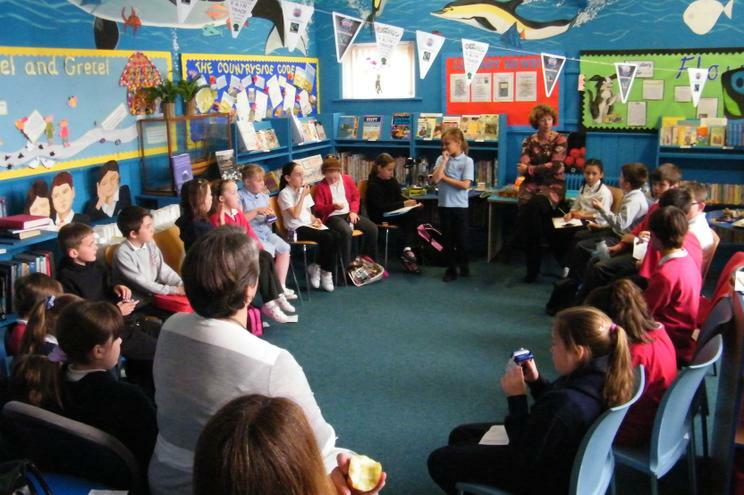 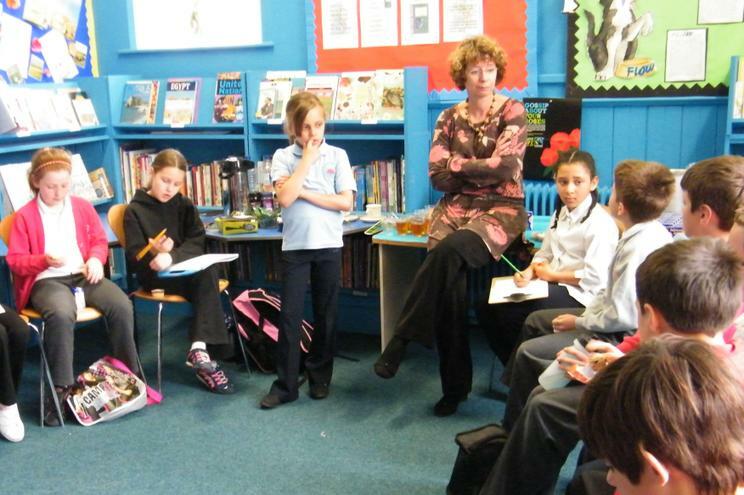 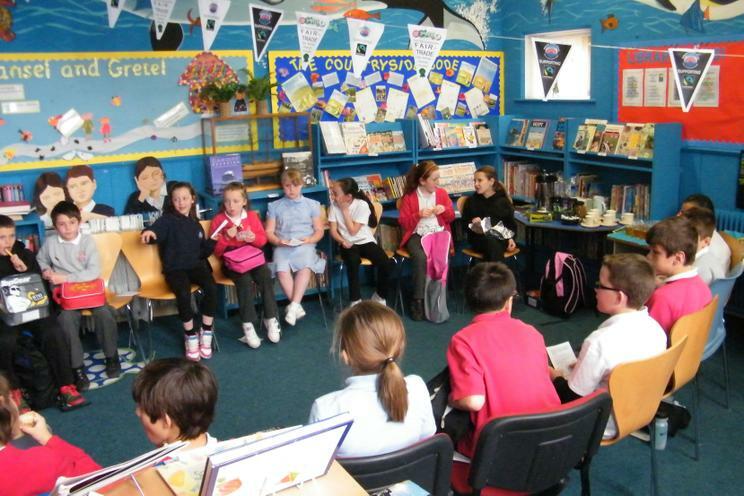 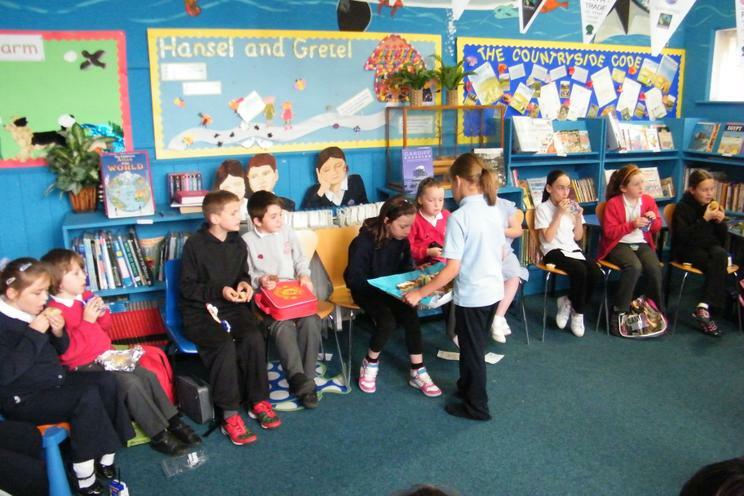 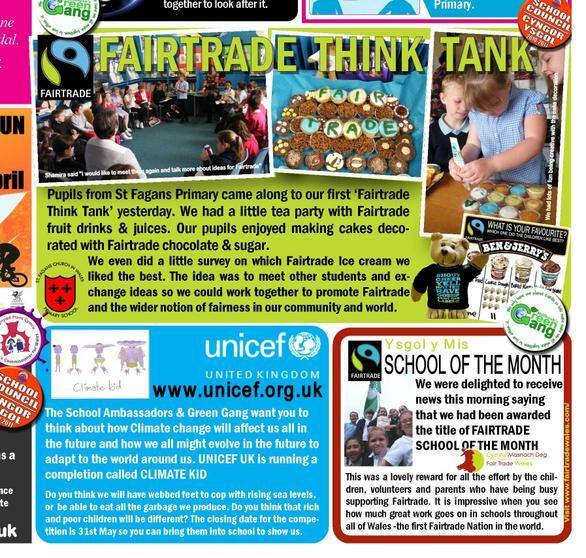 The idea is that we can both share any ideas and work on a joint project to promote Fairtrade in our community. 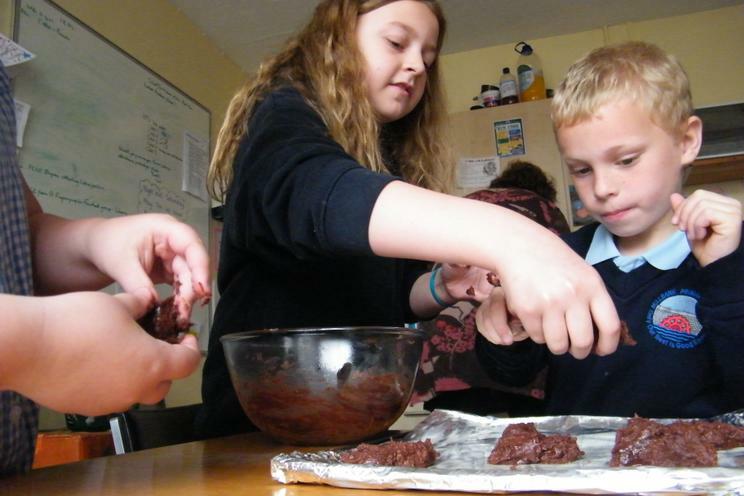 We really enjoyed baking Fairtrade Chocolate cookies and decorating the cake with Fairtrade chocolate and icing sugar earlier on at break. 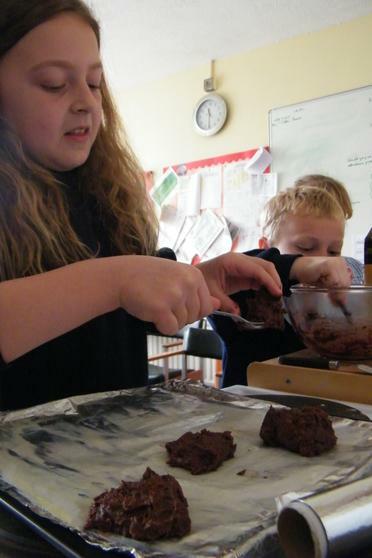 Our new friends told us that they often cook at their school and love it too. 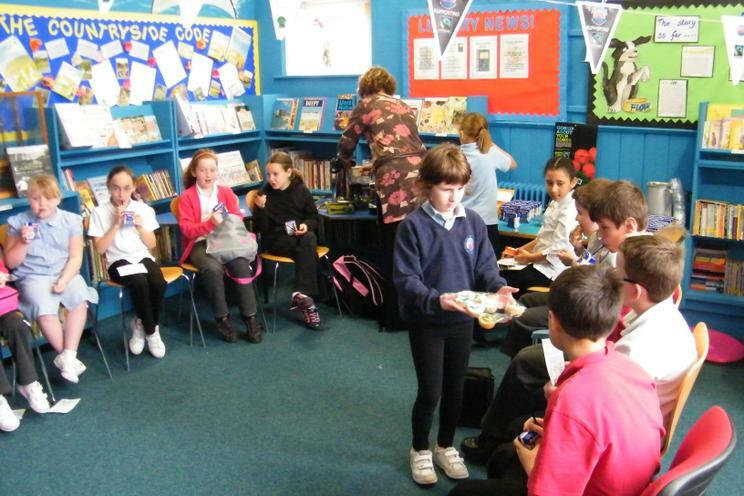 It was a working lunch and we had all given up our time to come to this event. 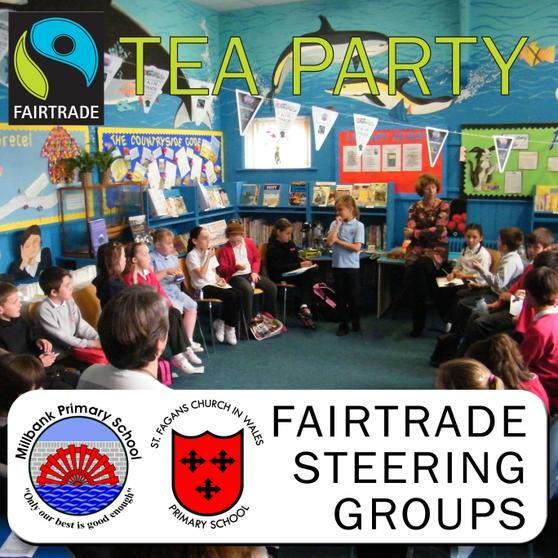 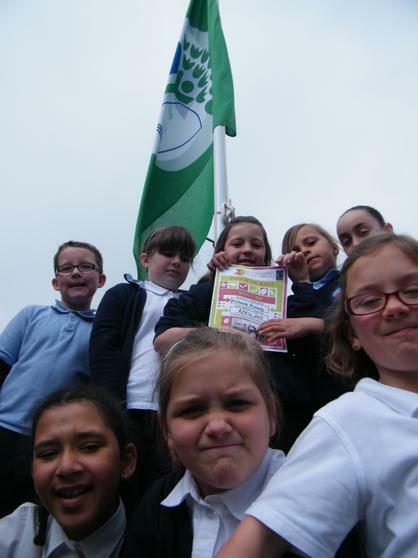 Mrs Lewis from St Fagans Primary had brought the Fairtrade Steering group down in a minibus. 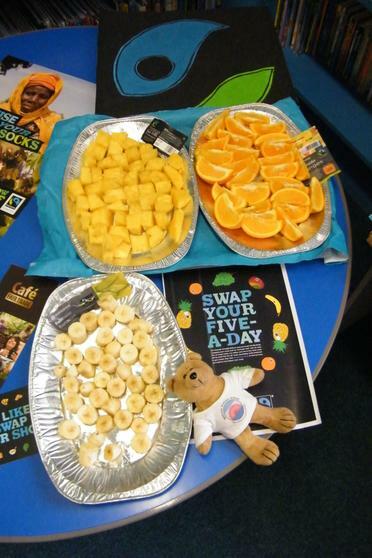 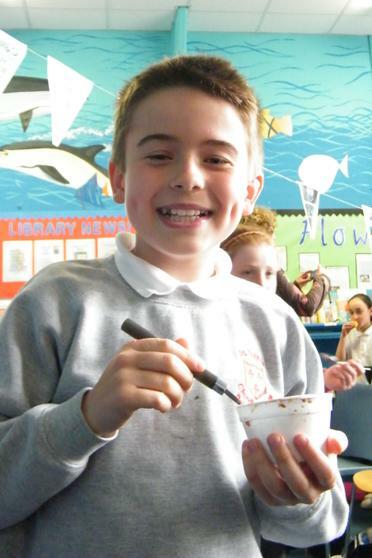 We introduced ourselves and said one fact about Fairtrade as we started eating our packed lunches. 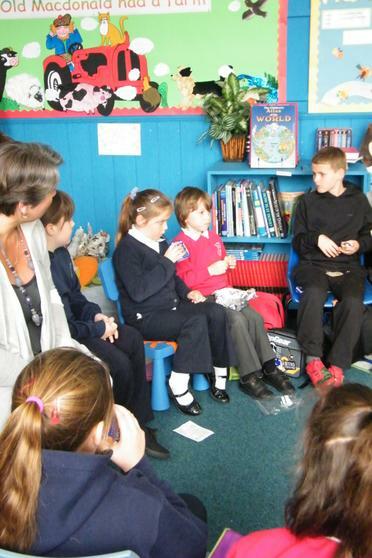 At first we were all a bit shy but we soon started chatting and relaxing. 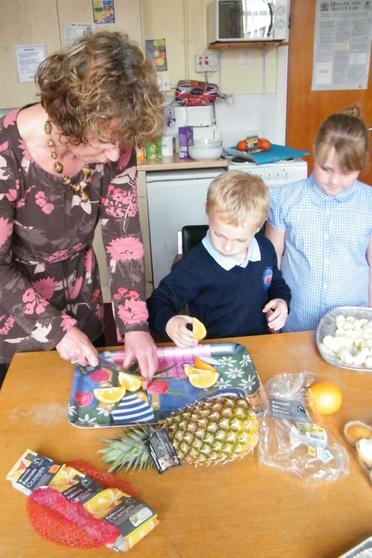 As hosts some of the children were keen to help take the trays of fruit, drinks and cookies around to our guests. 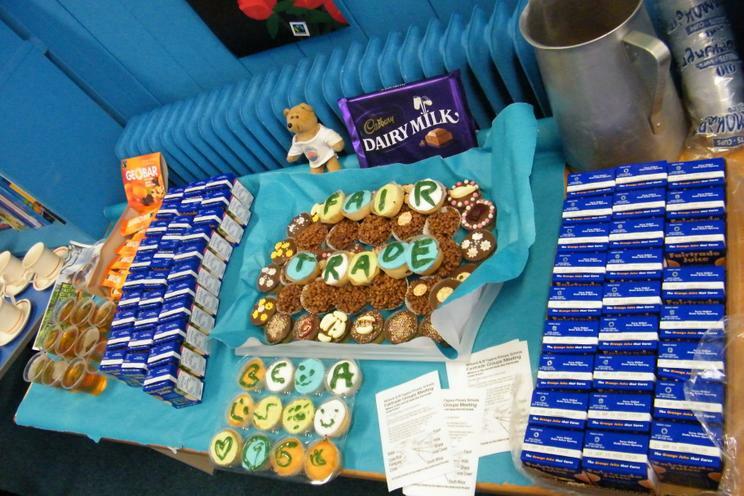 One of the reasons Fairtrade is so popular amongst young people and schools is of course they are really keen on being 'Fair.' 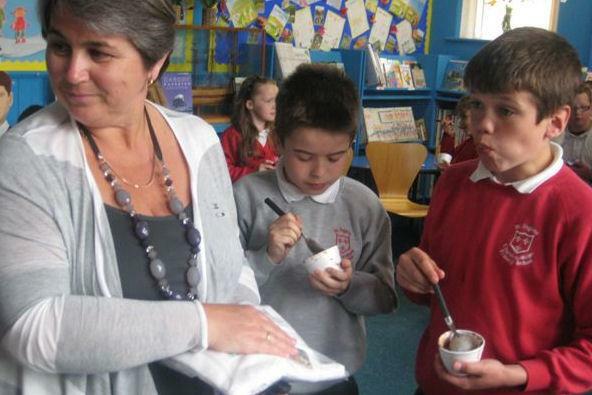 Grown ups sometimes just get cynical and know 'the world is not Fair!' 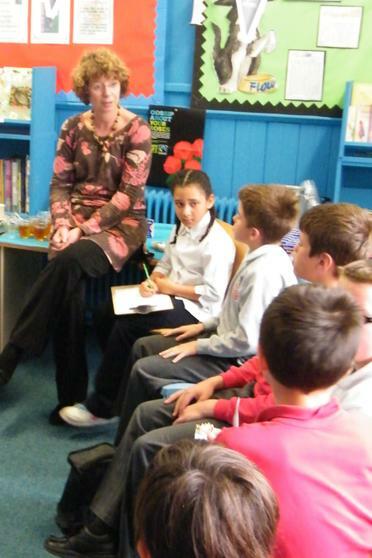 But perhaps all the adults need to listen to the children and we should all be working to make our world a fairer place. 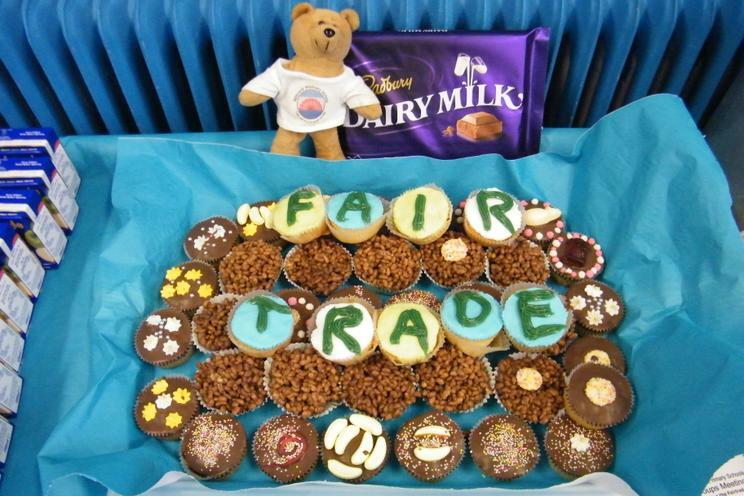 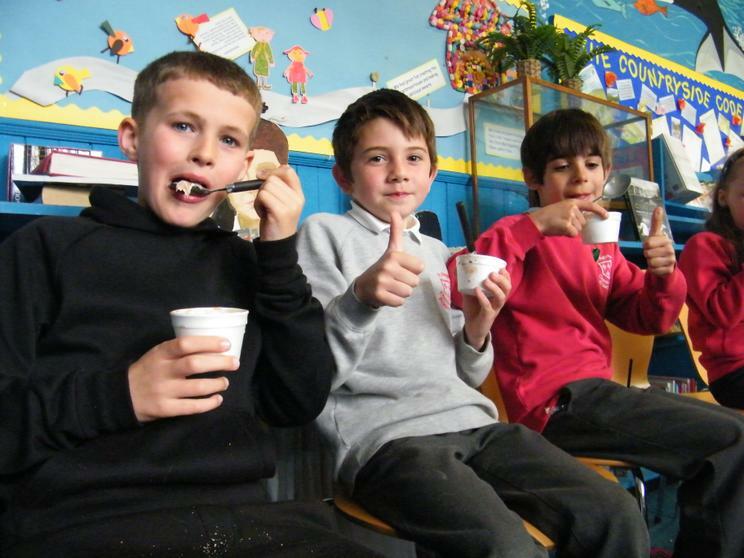 Buying and supporting Fairtrade is one way to do that, and as we know a jolly tasty way of doing so! 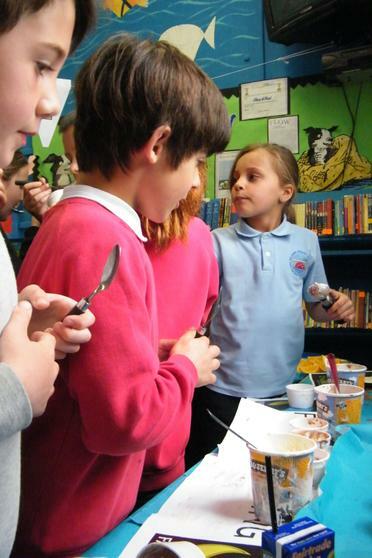 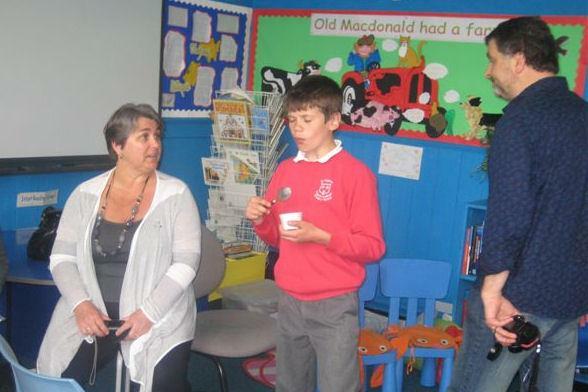 At the end of the session we had a quick Fairtrade tasting session of Ben and Jerry's Ice cream. 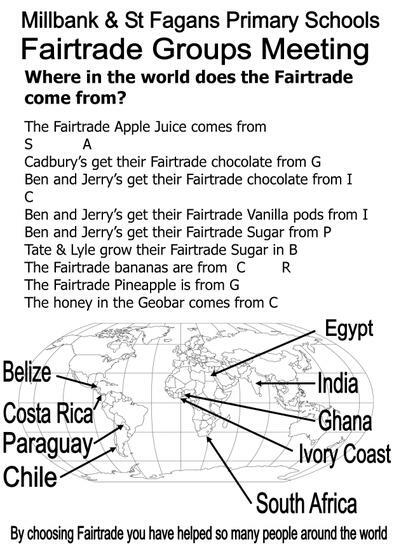 We asked how we could tell which one of the ice creams was not fairtrade, it was suggested 'we could read the ingredients'; 'check the price' (all cost the same £2, Fairtrade does not need to be the most expensive); but it did not take long before the simplest answer was discovered 'LOOK FOR THE FAIRTRADE LOGO' on the packaging! 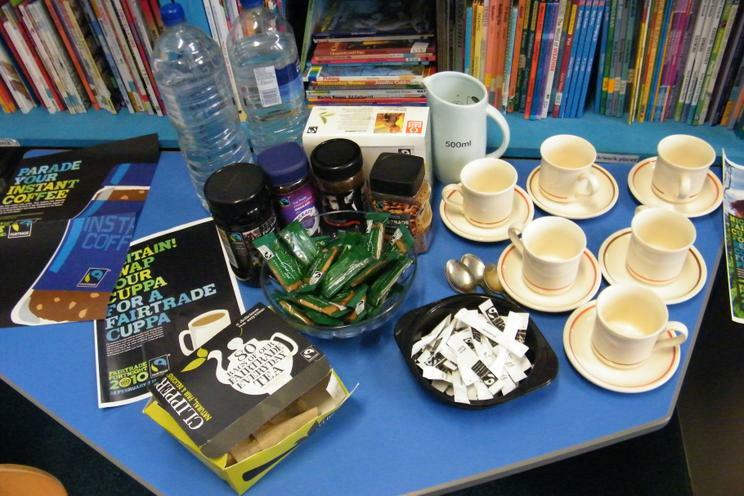 It does not matter what the product is tea, coffee, fruit bars, cookies or juice! 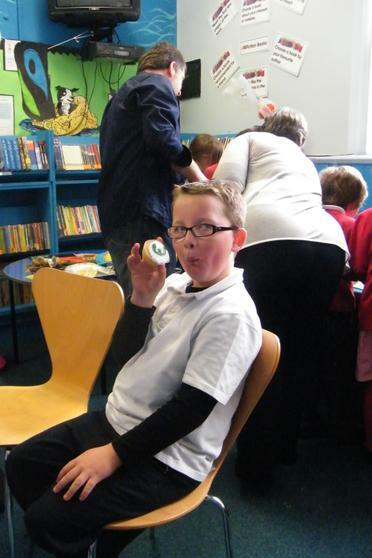 just look for the logo! 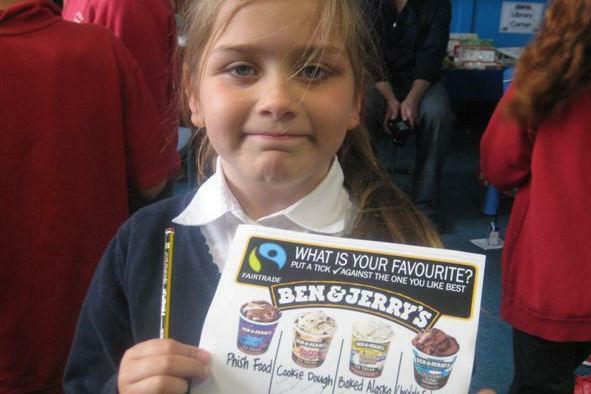 The result of our tasting was rather embarrassingly we loved the Cookie Dough flavour (which was not yet Fairtrade!) 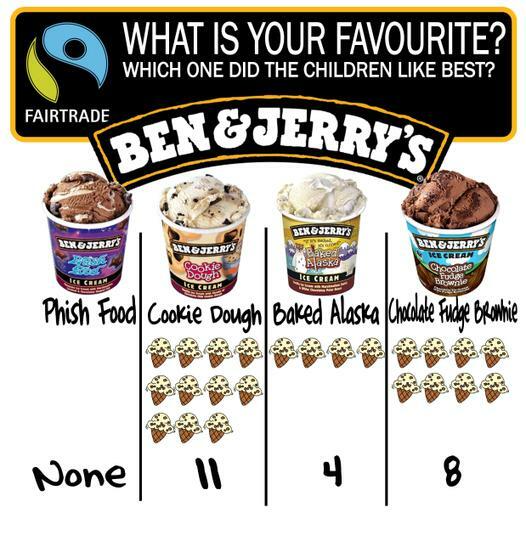 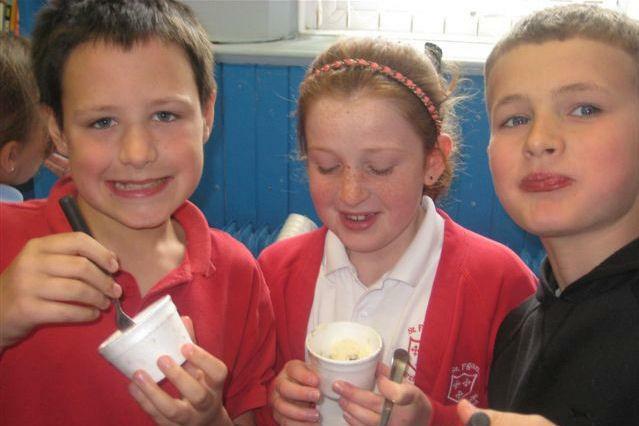 But we all loved the fact that they Ben &Jerry's are so committed to Fairtrade and will be making all their ice creams Fairtrade by the end of 2011 in the UK including Cookie Dough. 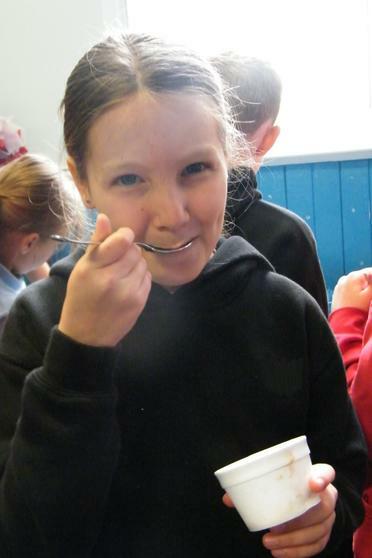 Tyra said "We had a fabulous time at lunch today!" 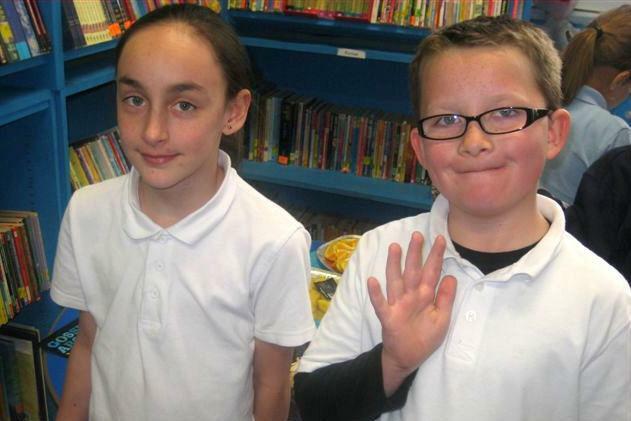 Ella "it is nice to meet other schools." 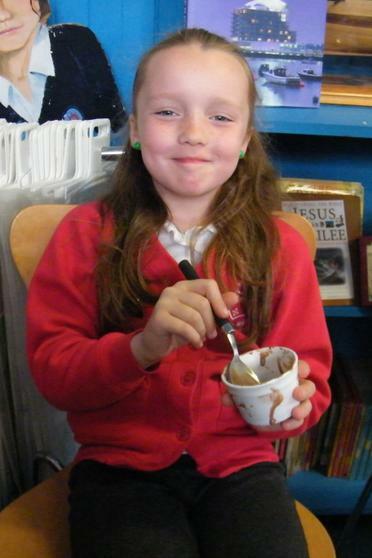 Chloe " I thought the tasting was a good idea, everyone enjoyed it. 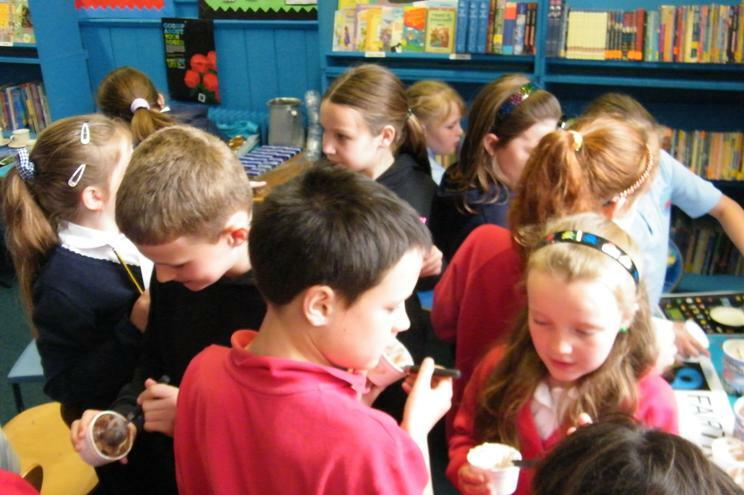 I liked the Baked Alaska Ice cream"
Shamira "I'd like to meet them all again and talk more about Fairtrade." 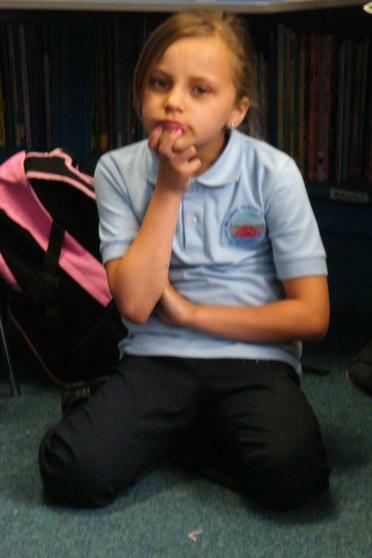 Sherraya "I thought it was brilliant! 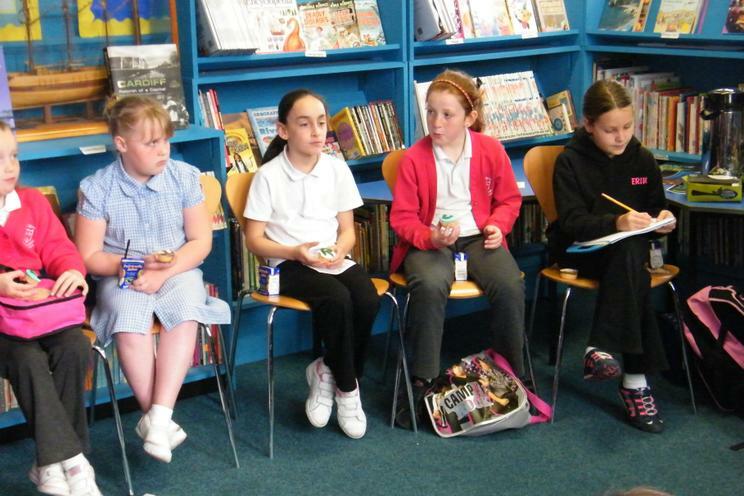 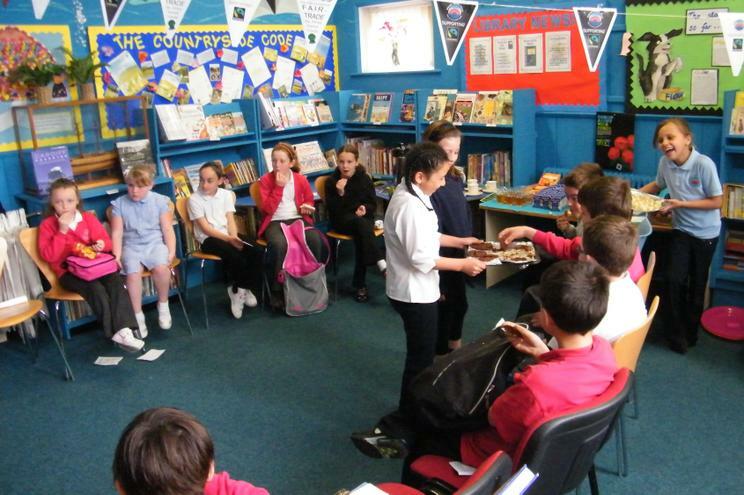 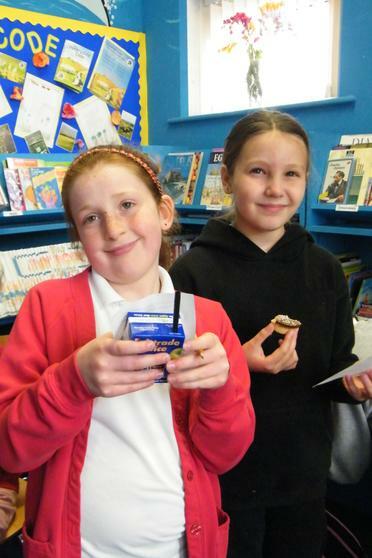 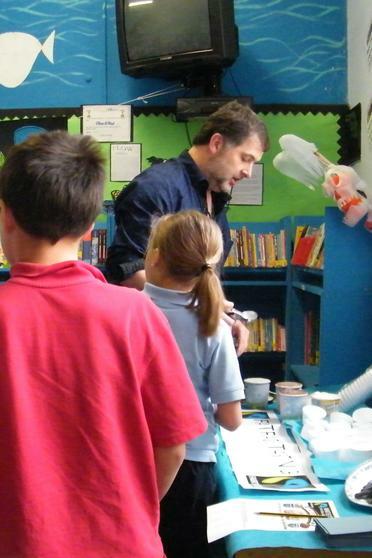 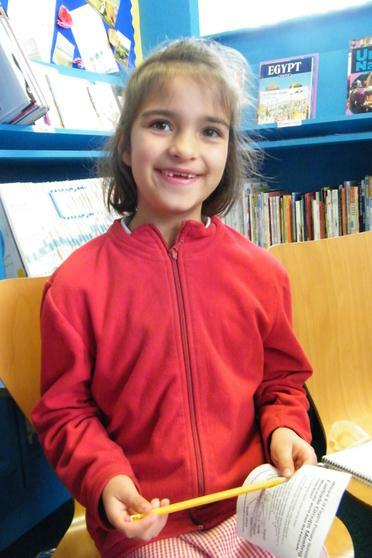 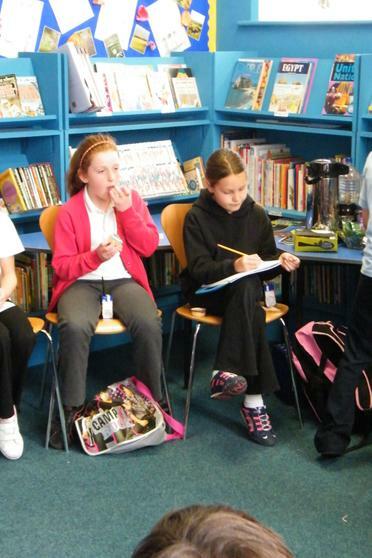 The cakes were delicious, the questions fun and we got to make new friends!" 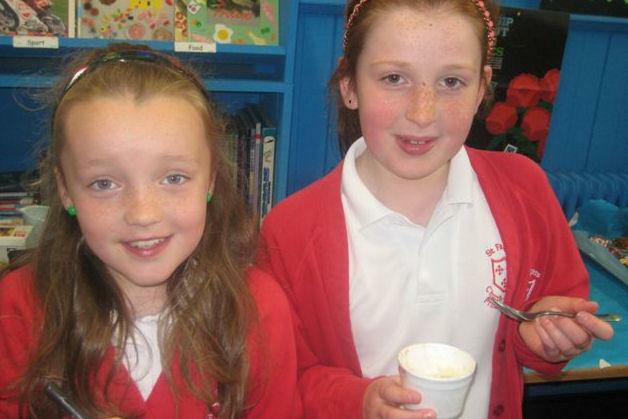 We are all looking forward to our return visit to St Fagans and working together in the future. 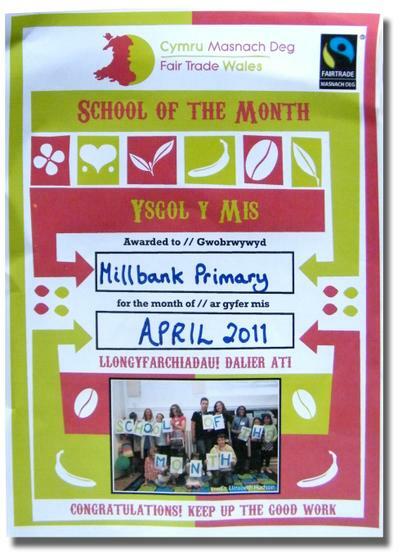 We were really delighted when the next day we had a certificate in the post from FAIRTRADE WALES saying that we had been awarded "School of the Month" for our work on Fairtrade, what a lovely way to finish our Spring Term.